Glass block panels are fantastic for bathrooms and basements, or any area of your home where you expect a bit more privacy. 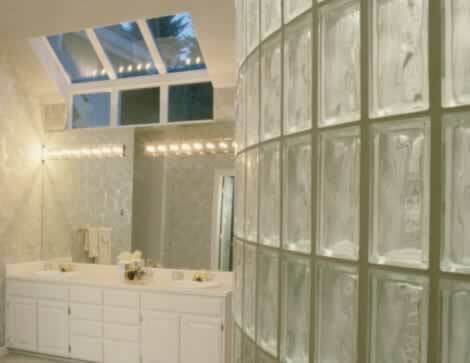 Instead of avoiding windows in your bathroom, why not use glass block instead? The visibility through glass block is limited, thus providing the privacy you need, but the light flow through the blocks can be rather vivid, allowing more than enough light into the room. Glass blocks come in all shapes and sizes, and can be used inside the bathroom to create architectural detail, even if they aren't going to be used as a window. For instance, glass blocks around a shower can provide privacy for the person inside while offering a touch of design flair. Glass blocks that create an exterior window can be set in vinyl, aluminum, wood, or any other kind of frame, the better to fit in with the other windows on your home.